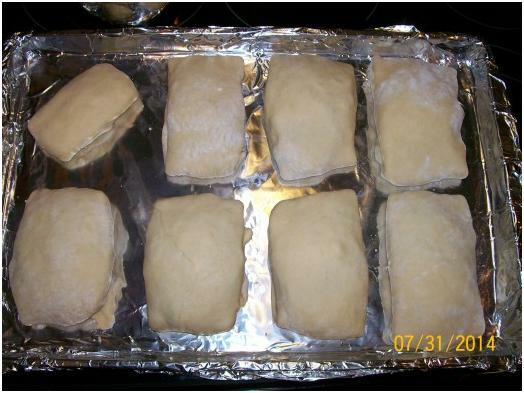 In this article you’ll learn how to make a healthier alternative to store-bought hot pockets. A filling meal the whole family will love! I filled mine with stir-fry veggies, rice, and mozzarella cheese. What? MAKE the crust?!? Pssshhhh. 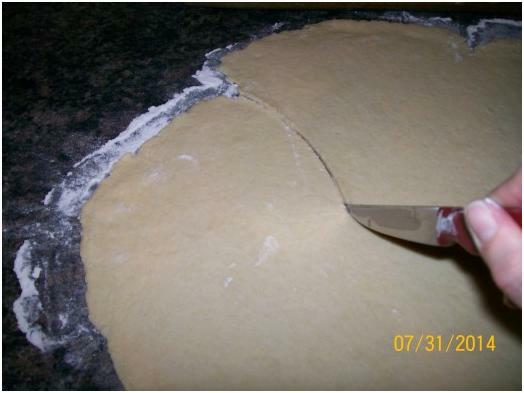 For those of you who are hating on this recipe for the homemade crust part–by all means–go buy you some frozen pie crusts from the store, or crescent dough if you like. Works just as well, I’m sure. I just happened to have the time and space… this time. 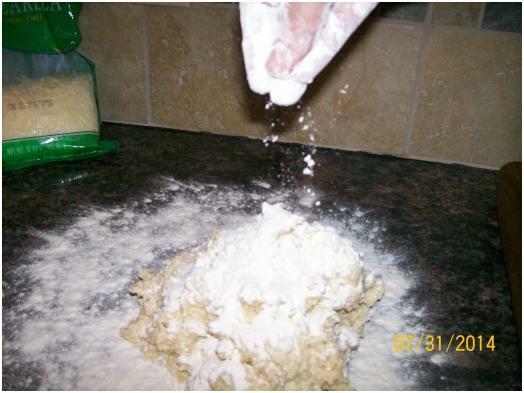 Yes, you are going to need a pretty big working area since you will be rolling out the dough to about 1/4-1/8 in. thick, and cutting random pieces out for your hot pockets. Yes, you will need a rolling pin (a pint glass or wine bottle if need be). But don’t fret! You’re a domesticated beast! Just wait and see, you’ll do just fine and we’ll be eating better in no time! LET’S COOK! Oh yes, Let’s! 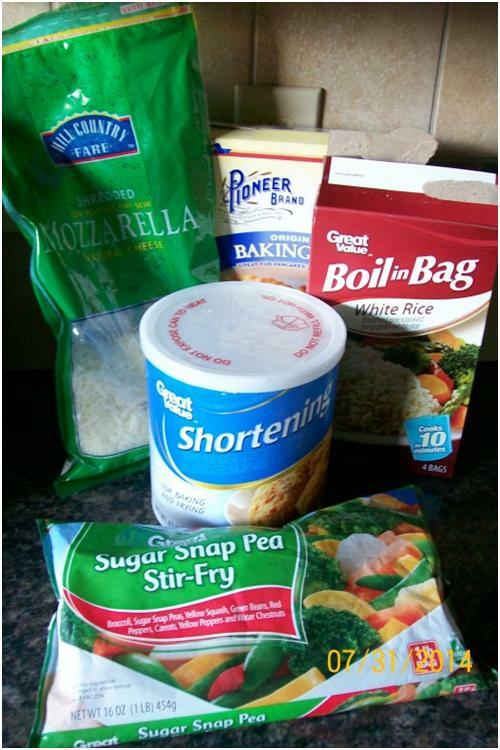 Cook rice and veggies according to package instructions. I don’t even salt the water the rice boils in, I just let it do it’s own thing. BOOM–HEALTHY, right there, we’re winning. Then I start my veggie pan off with some EVOO / Cilantro cubes I made a few weeks ago. Super simple, but that’s another post. 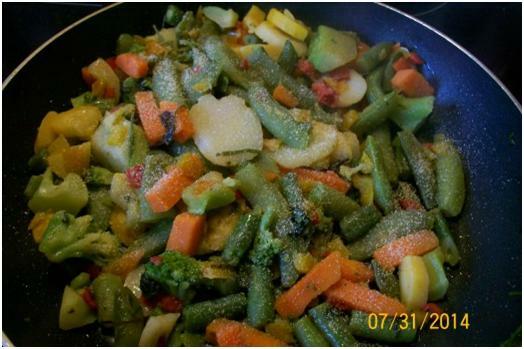 So get that oil sizzling, and pour in your veggies, throw on the lid. Cook 6-8 minutes on med high heat. I always sprinkle a little garlic powder and onion powder, just enough to add a little bit of flavor. I literally dust it, so as not to overpower the already amazing flavors happening. Also, toss in a dash of salt, just to taste. If you are feeling REALLY WILD… you can throw in like a tbsp of sesame seed oil. Gives it a hint of nutty nuttiness. MMMM. Stir gently, and continue cooking over medium high heat, but from now on… GO LID-LESS! That’s right! TAKE IT OFF! Cook another 5 minutes or so, depending on how done you like your veggies. I like ’em scorched… so I crank it up to high, toss, toss, toss… and remove from heat. Pour your rice in a bowl, and set in the fridge. You want it completely cooled before making your pockets. 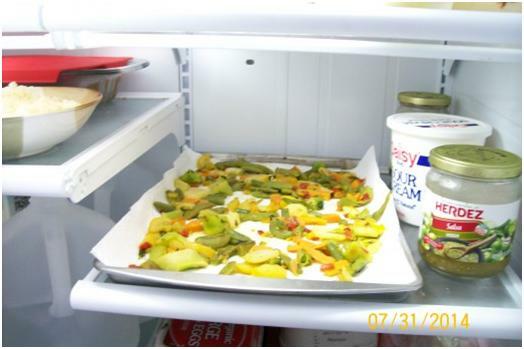 Spread the veggies out evenly so they’ll cool down faster. I know what you are thinking: What a PAIN, making my own pie crust! What does this person think, I have ENDLESS MOUNTAINS OF TIME!??!? No, I don’t think that. It’s just better than store-bought. It’s mostly just a pain to mix all the ingredients; you’ll need a little more strength than you may think to bust out a crust. But when you make it yourself, you are leaving out so many crappy ingredients that you just do not need. I personally feel better knowing what’s in the things I eat, so if I CAN make it, I try to. Plus, you can add spices to make it your own. Don’t have the time or the wherewithal to make it yourself? Buy it. Nobody will make fun of you. ***If this is your first crust, don’t worry. Take a deep breath. I’m right here to help. Besides, I’m teaching you how to cheat, so… chiiiillllll. I start off with about 2 cups of baking mix. Don’t be a sissy, just pour it. Measuring is over-rated. 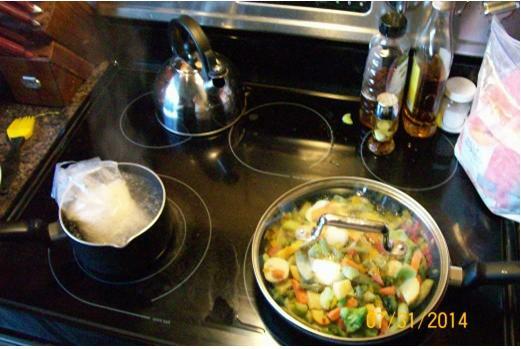 Throw your salt and spices in now, before adding the shortening or room temp coconut oil. Mix well. 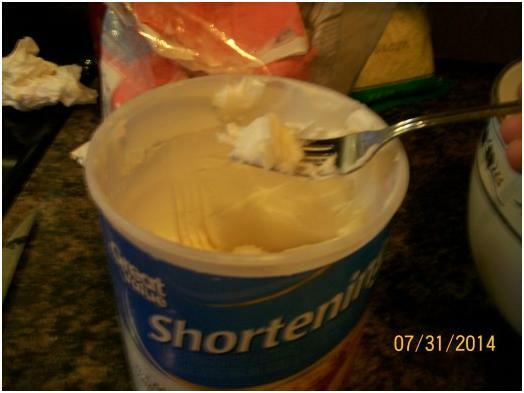 Grab a fork-full of shortening OR room temp coconut oil. Remember–measuring is over-rated. 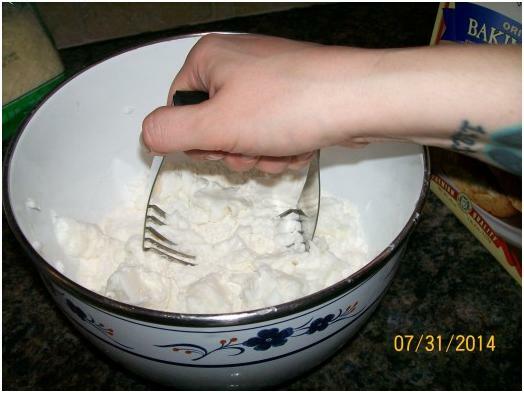 Smack (yes, smack) the fork on the edge of the bowl to drop the shortening in. 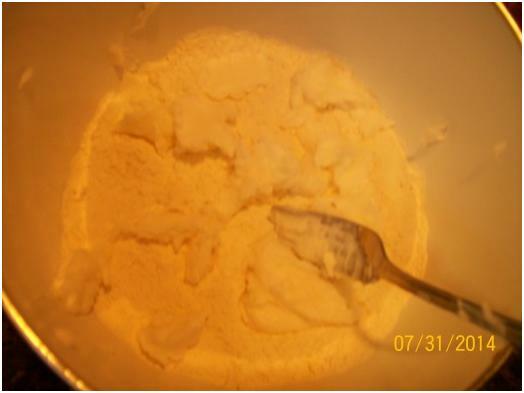 Repeat this until you’ve added about 2/3 cup to the baking mix. 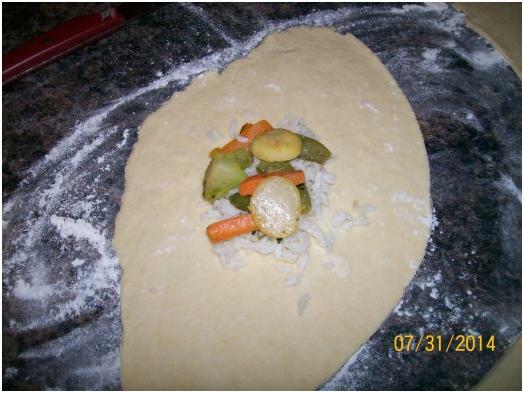 The more shortening you add, the flakier the crust will be, but the harder the dough will be to work with. It should look something like this. **You might have made a mess. I did. It’s ok. We’re still friends. Next, you’ll need to ‘cut in’ the shortening, which just means don’t SMASH it… gently cut it into tiny pieces. You can use a fork, but I really love having a pastry cutter. It makes a WORLD of difference. This one is a cheap, crappy one. It works. It should look like this. If it doesn’t, you’ve ruined everything. JOKING, joking. If its super chunky, there might be too much shortening, just add a little baking mix. Or vice-versa. You’ll get it worked out. I’ll wait. 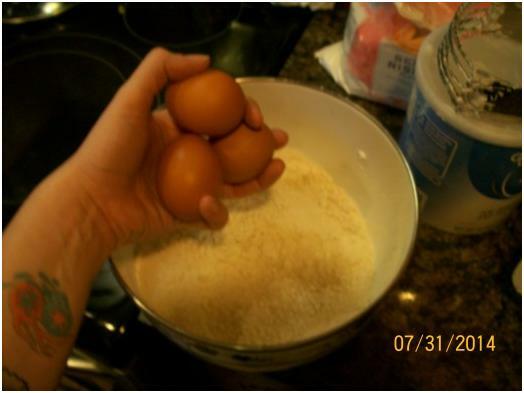 Add 3 eggs. Mix well. This is where you’ll need to Hulkify, but you’re ALMOST done! Hang in there!! It needs to be COLD. Next, you’ll need to add about 1/2 cup COLD water, from the fridge, not the tap. It needs to be very cold, like ice water, but NO ICE. That would be like cheating. We don’t do that. Mix well. Your dough should be very sticky. Not WET, but sticky. I really don’t think you need further explanation for this step. Spoon (or fork) out the dough, and sprinkle with even MORE flour. Don’t be afraid to have fun. This is fun, isn’t it? I NEED you to KNEAD it! Remember what I was saying about getting your hands a little dirty? It’s Time! 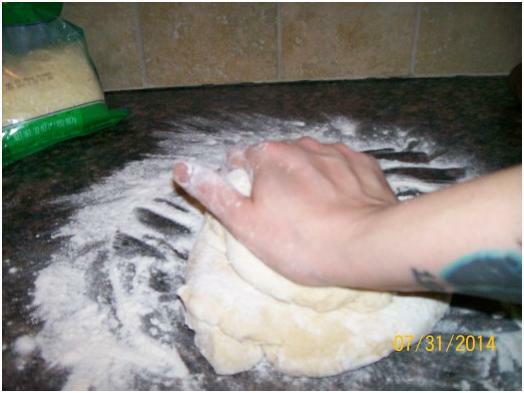 Knead the dough until it doesn’t stick to your work surface. 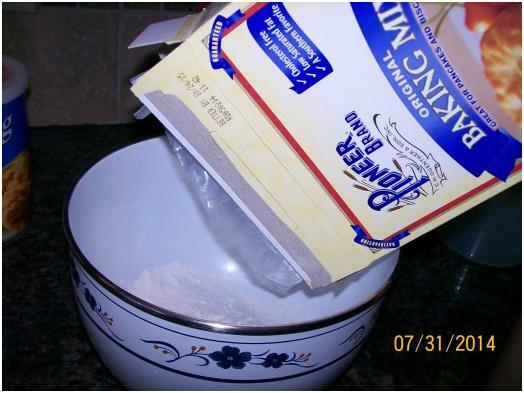 You may need to add flour several times until it stops sticking. 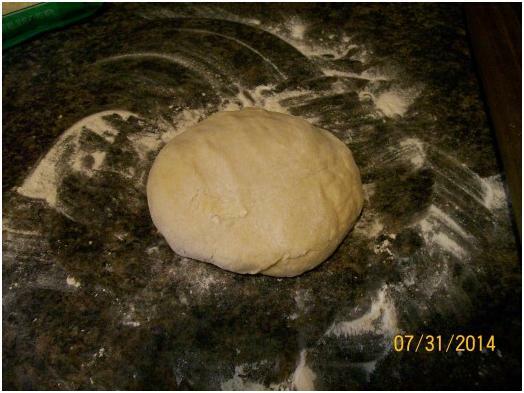 Your dough should form nicely into a ball. Now is a good time to get your oven heating up, set to 400*.You may need to re-flour your work surface before rolling it out. Be sure to flour your roller too. 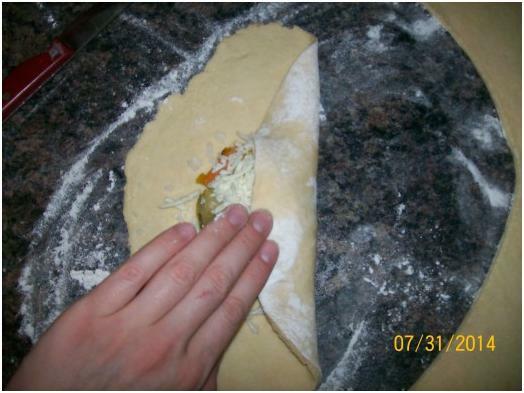 Roll the dough out until it’s less than 1/4 in. thick. Thinner than that is harder to work with, but crispier when cooked. Use your own discretion. Experiment. ***No children’s fingers were harmed in the making of this dough. Pull the rice and veggies from the fridge, and grab your mozzarella (or your cheese of choice). 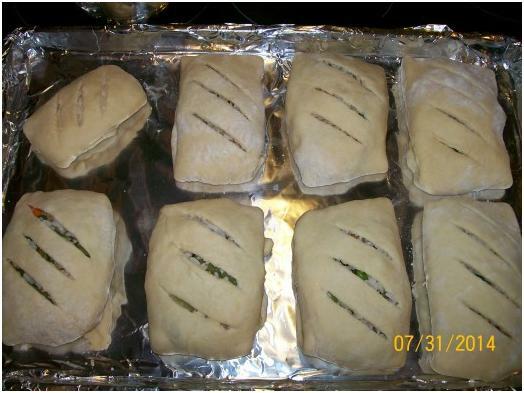 You will need another cookie sheet to put your hot pockets on, so go ahead and get that lined with foil. Do not grease it. You could be all organized and ‘thinky’ and have rolled your dough out into a big square. I think you have control issues. I like to throw caution to the wind, and let the knife flow. 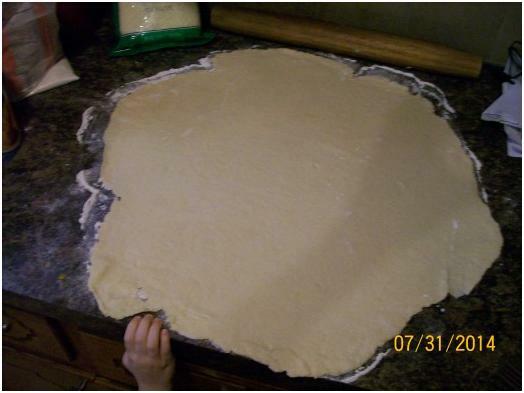 Cut a piece of dough about 5″ x 12″… ish. …what’s over-rated? Ahhh I can smell the oven getting hot! Next come the veggies. I like to be sure there is a little bit of every kind of veggie in each pocket. Next comes the cheese… this will technically be on the bottom. Fold, Fold, Fold….. ANNNND fold one last time, to close the pocket. 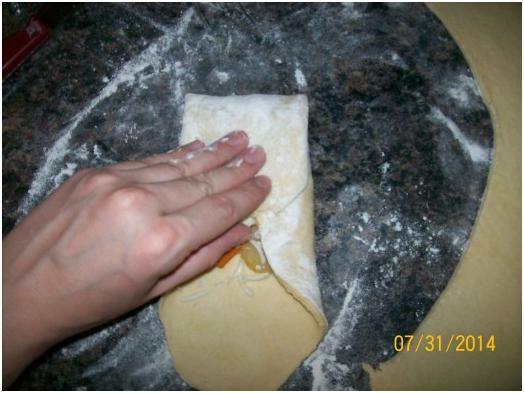 There are so many ways you could do this part, different kinds of pockets include a circle shape of dough with filling folded in half. Be adventurous! LIFE IS SHORT! 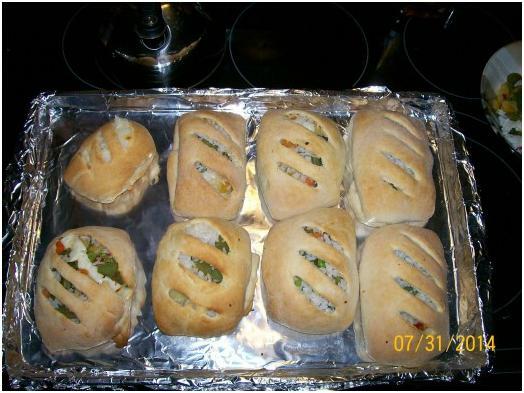 Place your hot pockets on your lightly greased foil-lined cookie sheet. Place your pockets about an inch apart. Notice my pockets look like a 5 year old made them. Nope, all me. Thought I was going somewhere else with that, didn’t you? Gotcha. I give each pocket 3-4 vents. You could also poke holes, stars, hearts…. you decide how ridiculous you want to be. Cook for 15 minutes, until they start to brown. Pull them out of the oven and check them. If you want them a little crispier or crunchier, give them another 5 minutes or so. Watch them closely, because you’ll be really mad at yourself if they burn! And THAT’S IT! These are so good. They keep in the fridge for a day or two, but once the rice starts to dry out, it gets hard. And I’m sure you can imagine how enjoyable that is, expecting the world and… biting into what feels like a rock. Not cool. YES! You are done. Booyah! That wasn’t so hard, was it? Trust me, it only gets better from here. Think of the possibilities!! Cheddar and broccoli, mozzarella and chicken, I’m even dreaming up an enchilada inspired version of these! Had your fill and still have pockets!? Throw these bad boys in a large ziploc to help maintain freshness and keep the rice soft, and you’ve got lunch for tomorrow. MMM! 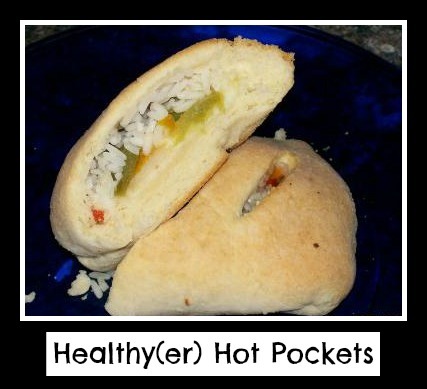 Way healthier than freezer aisle hot pockets, and in my opinion, of my own recipe, yeah, these are the bomb. I hope you enjoy these as much as my family does! And like I may have mentioned above, be adventurous!! People get hung up on specific ingredients, measurements… this just isn’t that kind of recipe. So have fun. I know I did. Those look yummy! Pinning them! Let me know how they turn out!! I can’t wait to try them myself!! Oh wow! This is such a cool idea! I totally want to give this a try. What was the total cooking time?! I want one now! !